New Wyse 5000 5012-D10D Desktop Slimline Thin Client - AMD G-Series T48E Dual-core (2 Core) 1.40 GHz - 2 GB RAM DDR3 SDRAM - 8 GB Flash - AMD Radeon HD 6250 - Gigabit Ethernet - Wyse Thin OS - DisplayPort - DVI - Network (RJ-45) - 4 Total USB Port(s) - 4 USB. Wyse 5000 5012-D10D Desktop Slimline Thin Client - AMD G-Series T48E Dual-core (2 Core) 1.40 GHz - 2 GB RAM DDR3 SDRAM - 8 GB Flash - AMD Radeon HD 6250 - Gigabit Ethernet - Wyse Thin OS - DisplayPort - DVI - Network (RJ-45) - 4 Total USB Port(s) - 4 USB. Some items we sell may be non-refundable and/or returnable. Non returnable products include but are not limited to. Software Subscriptions CD's DVD's Downloadable Products Make Up Personal Hygien Products. All orders are packaged carefully for safe travel. 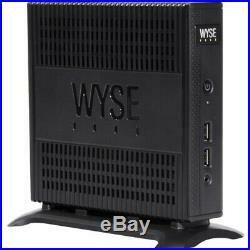 The item "New Wyse 5000 5012-D10D Desktop Slimline Thin Client AMD G-Series T48E Dual-co" is in sale since Tuesday, March 19, 2019. This item is in the category "Computers/Tablets & Networking\Enterprise Networking, Servers\Servers, Clients & Terminals\Thin Clients". The seller is "asfertec" and is located in Colorado Springs, Colorado. This item can be shipped to United States, Canada, United Kingdom, Denmark, Romania, Slovakia, Bulgaria, Czech republic, Finland, Hungary, Latvia, Lithuania, Malta, Estonia, Australia, Greece, Portugal, Cyprus, Slovenia, Japan, China, Sweden, South Korea, Indonesia, Taiwan, Thailand, Belgium, France, Hong Kong, Ireland, Netherlands, Poland, Spain, Italy, Germany, Austria, Bahamas, Israel, Mexico, New Zealand, Philippines, Singapore, Switzerland, Norway, Saudi arabia, Ukraine, United arab emirates, Qatar, Kuwait, Bahrain, Croatia, Malaysia, Chile, Colombia, Costa rica, Dominican republic, Panama, Trinidad and tobago, Guatemala, El salvador, Honduras, Jamaica, Viet nam, Uruguay.